Bhavya Ravi, a Neuroscience PhD student, and Jessica Garcia, a Biology graduate, in Assistant Professor Kevin Collins’s lab recently reported in the Journal of Neuroscience how a model serotonin motor circuit develops just the right amount of activity to drive a simple behavior. Studying egg-laying behavior in the nematode worm Caenorhabditis elegans, Ms. Ravi found that feedback from the postsynaptic muscle cells drives ‘burst’ firing in the presynaptic serotonin neurons that drive the timely release of eggs. This feedback mechanism responds to the accumulation of eggs in the uterus, allowing the circuit to turn on, and stay on, until the uterus is no longer mechanically stretched. Sterile or young animals fail to maintain ‘burst’ firing in the serotonin neurons and do not try to lay eggs. Animals with too many eggs show a homeostatic increase in neuron activity that keeps the egg-laying circuit active until uterine stretch is back to normal. Using lin-12 Notch receptor mutants that block the connection between presynaptic neuron and postsynaptic muscle (below), Ms. Ravi was able to disrupt this novel form retrograde feedback. Such homeostatic mechanisms allows neural circuits to drive flexible 'just-in-time' patterns of activity that scale behavior output in response to biological need. 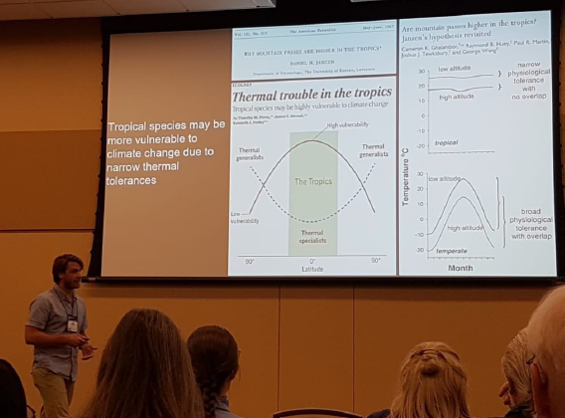 Timothy Perez (graduate student in the Feeley lab) recently attended the Botanical Society of America's 2018 conference in Rochester, MN, where he presented his talk entitled, “Photosynthetic heat tolerances are correlated with maximum leaf temperatures.” Tim was awarded the Li-COR Prize in recognition of his talk being the "best presentation made by any student, regardless of subdiscipline" at the annual botany meeting. With over 500 residential canals in the Florida Keys, near shore water quality suffers from many pollution sources. What role do the man-made canals play in coastal ecology and diversity of marine life? This project aims to look at the coastal water quality inside and outside of the residential canals to determine levels of nutrient loading. This project is especially important with the passing of Hurricane Irma in 2017, and the subsequent impacts of debris in the canals. Trop Bio Lab PI’s Dr. Floria Uy and Aresty Chair Al Uy receive a grant from NSF to expand their Study Abroad field course in the Solomon Islands. Targeting underrepresented students in STEM (i.e., women and minorities), this project will train cohorts of undergraduate students in field research and conservation science. An international team from the University of Miami and local non-government organizations will lead the program, offering diverse perspectives and unique expertise to create a thriving environment for student mentorship. The major goal is for students to first leverage natural systems by executing group experiments that explore how populations meet the challenges of their natural and dynamic environment. Students will then expand on this understanding of natural systems by developing independent projects to test how the same populations respond to human-mediated changes. A follow-up course in the US will provide additional training and career development, with the goal of publishing the student projects in peer-reviewed journals. The result is a program where a diverse, international team will equip the next generation of scientists with a more global perspective to tackle our planet's most pressing challenges. Kenneth Feeley – Associate Professor of Biology and Smathers Chair of Tropical Tree Biology – has received a new grant from the US National Science Foundation (NSF) to fund his research on the effects of climate change in Amazonian and Andean forests. 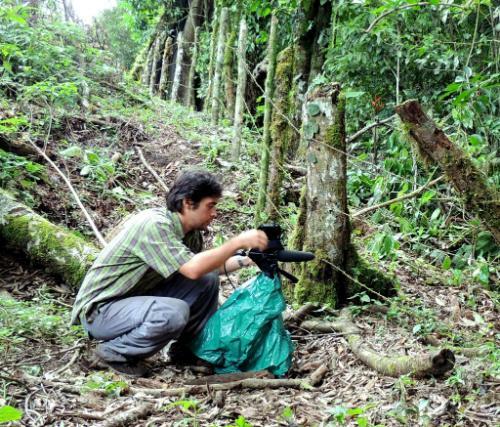 The grant is entitled “A natural laboratory for studying biodiversity, ecosystem function, and responses to environmental change from Amazonian lowlands to Andean treeline" and is part of the NSF’s Long Term Research in Environmental Biology program designed to support research into large-scale complex problems that require sustained funding. 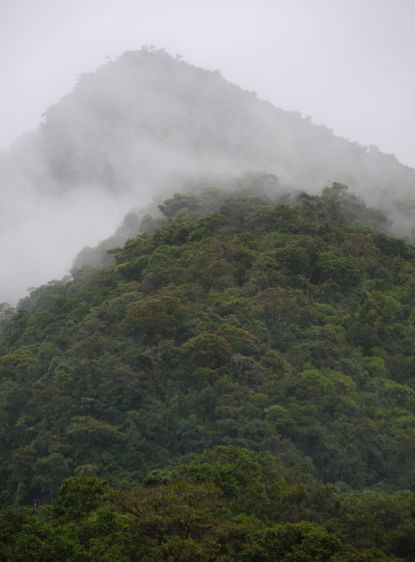 The funding will allow Feeley and his collaborators to expand their studies in the Peruvian Andes investigating at how ongoing changes in temperature and precipitation are altering forest composition and tree population demography. “What does it mean to be an animal? Looking across the kingdom’s 35 phyla, it’s tempting to think that some are more advanced, more complex, more valuable than others. Aristotle drew such a hierarchy in his Scala Naturae. Humans perch on the highest rung of the ladder. Then come primates and the other mammals, followed by fish and reptiles and finally the various invertebrate lineages. To read the full article, follow this link: What is a Lab Animal? Aresty Professor Al Uy receives a grant from Conservation International’s Critical Ecosystem Partnership Fund to empower three indigenous communities in the South Pacific. The grant will support the development and official registration of a large conservation area in the Solomon Islands through grass-roots, capacity building. 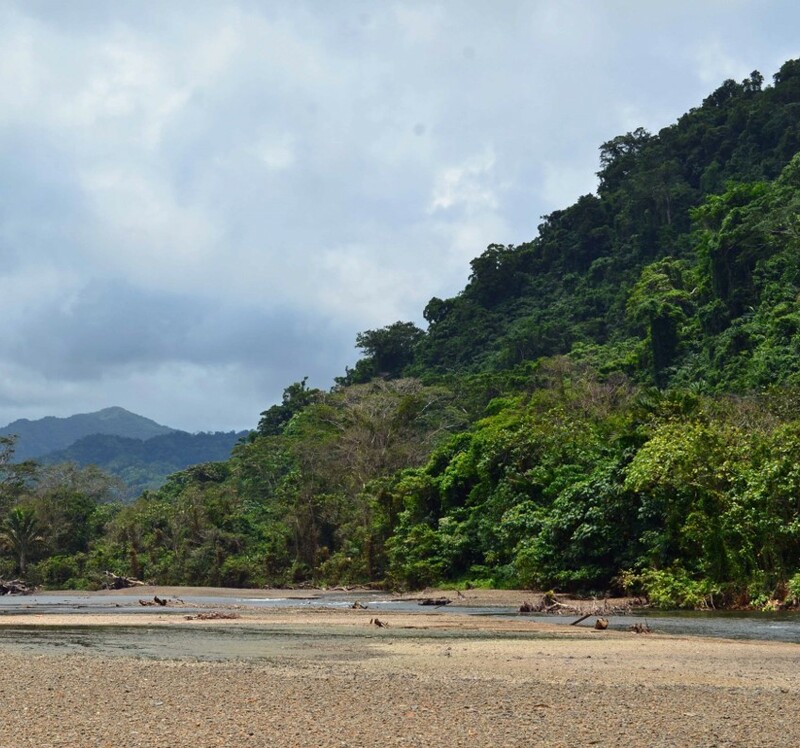 The proposed conservation area will consist of about 40,000 acres of pristine cloud and rainforest in Makira Island, which is under constant threat from commercial logging. Rob Kozol is the 2018 recipient of the Graduate Award for Excellence from the Graduate School at the University of Miami. He earned this award as a bold, careful, generous, and committed scientist who has defined a new area of inquiry into the early role of ASD-linked genes in nervous system development, with significant implications for both basic and applied science. Convergent evolution, a process in which two or more populations evolve the id‌entical trait in response to similar ecological conditions, is one of the most compelling evidence for the operation of natural selection in the wild. 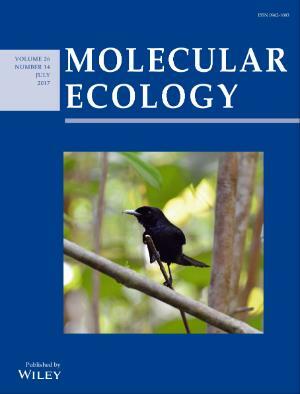 In a recently published paper featured on the cover of the journal Molecular Ecology, former postdoc Liz Cooper and Aresty Professor Al Uy use genomic approaches to test if multiple, isolated populations of a Solomon Island flycatcher have evolved identical plumage color convergently. Several island populations of the Monarch flycatcher have entirely black plumage (see image to the left). Because birds from these populations look identical in color, taxonomists have traditionally classified these island populations as a single subspecies. Contrary to this classification, however, Liz and Al found that the populations actually evolved the same plumage color independently, with each population having unique genetic mutations to create entirely black plumage. ‌The Coastal Ecology Laboratory will be working with Biscayne National Park on “Diversity Counts!” Diversity Counts! 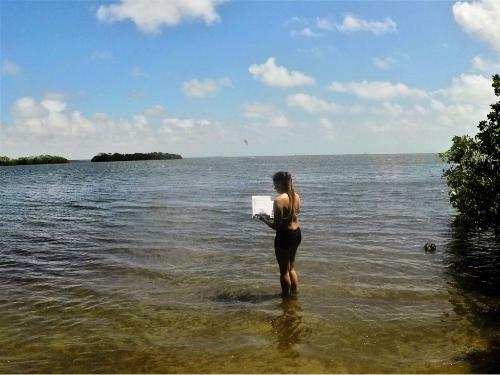 is a citizen science project to evaluate the success of the Biscayne Bay Coastal Wetlands restoration projects adjacent to Biscayne National Park, Florida. 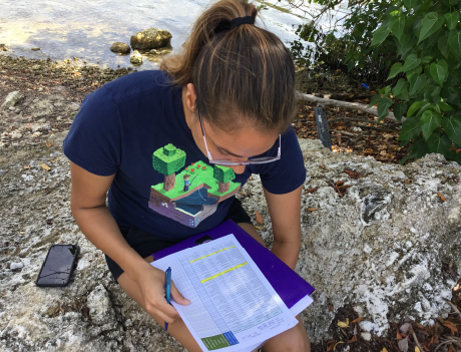 Krystle Young, a Masters student in the Coastal Ecology Laboratory, is studying the effectiveness of citizen participation in recording rare or unusual species sighted in Biscayne Bay. Diversity Counts! includes Miccosukee and Seminole high school students in collecting data that can help inform coastal management in the national park. ‌Dr. Kenneth Feeley – Associate Professor of Biology and UM’s Smathers Chair of Tropical Tree Biology – and his former graduate student, Dr. Brian Machovina, have published a new paper in the journal Science of the Total Environment on “Restoring low-input high-diversity grasslands as a potential global resource for biofuels”. In their paper, Machovina and Feeley calculate the amount of electricity and fuel that could theoretically be produced in each country’s grasslands and pastures if the native grassland species were used for biofuel production rather than for cattle grazing. They find that large amounts of energy, far in excess of many country's current power and fuel demands, can potentially be produced from processing of grassland biomass grown on converted pastures, especially in tropical developing countries. In fact, over 40 countries could meet more than 100% of their domestic demands for electricity, gasoline, and diesel fuel through energy production with native grassland species, thereby eliminating these countries' need to extract fossil fuels or convert natural habitats to energy production. 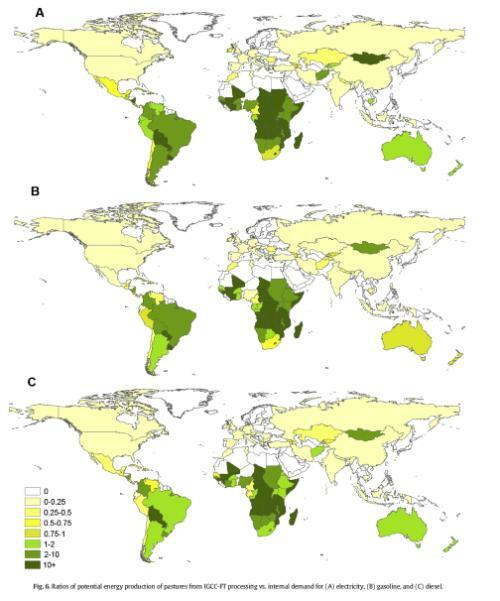 While Machovina and Feeley acknowledge that a complete conversion of pasture lands to biofuel production is unrealistic, their analyses highlight the potential gains in ecosystem services and energy production that could theoretically be achieved on already-managed lands.. The figure above shows the ratios of potential energy production of pastures from integrated gasification facilities for power (IGCC) and Fischer–Tropsch (FT) processing vs. internal demands for (A) electricity, (B) gasoline and (C) diesel. ‌This paper Ultrastructural Analysis of Zebra Fish (Daniorerio) DHDDS Retinitis Pigmentosa Disease Model Functionally Links DHDDS to Mitochondrial and Membrane Dysfunction grew from hallway discussions in the basement of Cox where Drs. Jeff Prince and Julia Dallman have their labs and had the pleasure of working with a talented UM undergraduate, Scott Miyazaki. The project was part of a larger collaboration with Dr. Rong Wen a researcher from the Miller School of Medicine Bascom Palmer Eye Institute to investigate biological basis of a genetic form of blindness. The pictures above are electron micrograph images of zebrafish retina at lower (A) and higher (B) magnifications. Abbreviations are as follows: Xan- xanthophores, RPE retinal pigment epithelium, P-plexiform layer, n-nuclues, os-outer segment, m-mitochondria. Dr. Jeff Prince passed away April 27, 2017, shortly after this paper was published and the basement is much quieter without his booming voice and good cheer. ‌‌‌‌Dr Kathleen Sullivan Sealey received funding the Waitt Foundation Rapid Ocean Response program to find out what has happened to the coastal environments of The Bahamas after Hurricane Matthew in October of 2016. The Hurricane Matthew Project was a collaborative project to document the impacts of Hurricane Matthew on coastal neighborhoods of New Providence, The Bahamas. The Coastal Ecology Lab, which is led by Dr. Sealey, included Ellery Lennon (research assistant, BS Biology 2016) and Jacob Patus (doctoral student in Biology) as well as undergraduate students Caitlin Camarena, Alexandra Ford and Kayla Laraia. 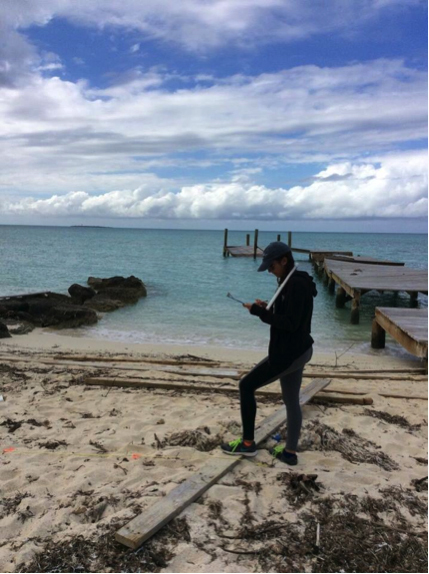 The Coastal Ecology Lab partnered with Young Marine Explorers, a Bahamian citizen science program, led by Nikita Shiel-Rolle (UM alumnae). The team carried out rapid impact assessments to document damage from Hurricane Matthew to the coastal zone and associated coral reefs, the field surveys included both developed coastlines and protected coastal parks. The Coastal Ecology Lab collected data on coastal assessments (coastal rankings before and after the hurricane, coastal erosion impacts, and solid waste surveys) and underwater assessments (sediment sampling, water quality surveys, fish surveys, invertebrate surveys, and marine plant surveys). Young Marine Explorers was tasked with collecting damage rankings (building damage, vegetation damage, and flood severity) in Bahamian neighborhoods. The hurricane impact assessment produced maps showing the extent and severity of damage for future mitigation. The research has led to recommendations for restoration and monitoring; impact maps were shared with the communities to inform rebuilding or re-locating coastal neighborhoods. Sealey concluded that areas with less human alteration and larger coastal vegetation buffer zones experienced less storm damage. 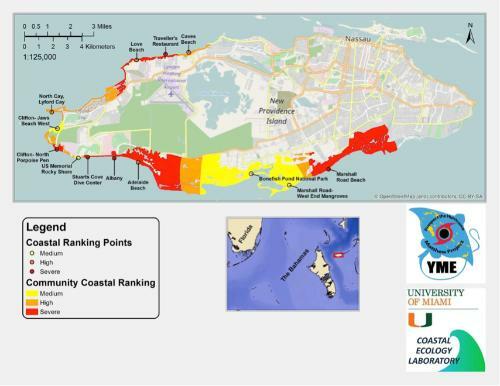 Additionally, human- altered coastlines contributed more trash and pollutants to coastal oceans; conclusions emphasized the importance of solid waste management before storms. .
Coastal impact rankings for communities across New Providence, The Bahamas. UM student Kayla Laraia conducts a solid waste assessment on Jaws Beach, New Providence. 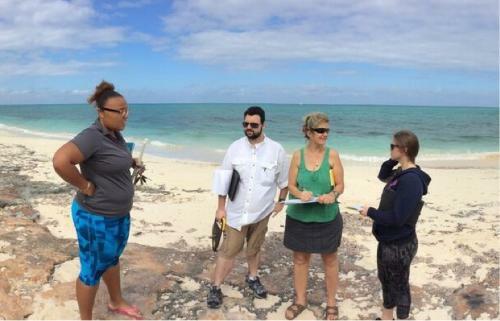 Dr. Sealey discusses coastal erosion impacts with Nikita Shiel-Rolle, Jacob Patus, and Alexandra Ford. 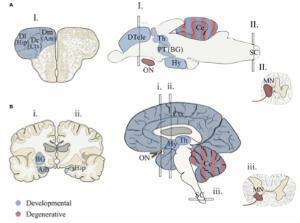 ‌‌‌‌This study Spatial patterning of excitatory and inhibitory neuropil territories during spinal circuit development published in the Journal of Comparative Neurology was an interdisciplinary effort from the UM Biology Department: two developmental neurobiologists Qing Yan (PhD in 2016) and her advisor Julia Dallman were helped in statistical analyses by Lu Zhai (Sternberg lab; PhD in 2017) and in applying a mathematical model designed to analyze spatial patterns of trees in a landscape to synapses in a neuropil by Bo Zhang (DeAngeles lab; PhD in 2017; currently in van Dyken lab). 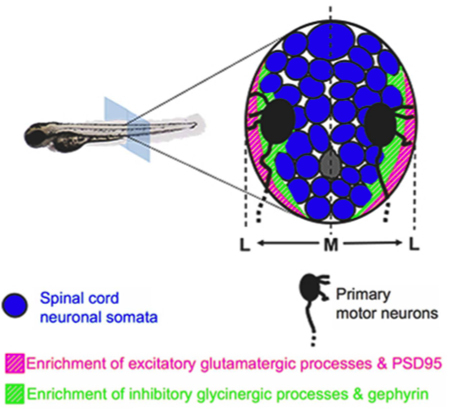 Authors provide a systems-level view of how neuronal connections are structured during development in the zebrafish spinal cord. They find that excitatory and inhibitory neuronal processes and synapses enrich in distinct spinal neuropil territories with excitatory enrichment lateral and inhibitory enrichment medial adjacent to neuronal somas. The establishment of such a highly structured framework early in development promotes a balance between excitation and inhibition that is necessary for coordinated movements. ‌‌‌‌Research Assisant Professor Floria Uy, Aresty Chair Al Uy and participants of the Solomon Islands field course (2015) publish a paper testing how crabs avoid avian predators through camouflage or crypsis. Animals can match their background to avoid detection by predators. For instance, numerous species have evolved color patterns that help them blend into their surroundings and avoid predators -- a phenomenon called crypsis. A new experimental study found that ghost crabs in the Solomon Islands may achieve crypsis by actively choosing to live in sand background that matches their body color. Sarah Cowles, a Ph.D. graduate student in the (Al) Uy Lab, has received a 2017 Grants-in-Aid of Research Award from the Society for Integrative and Comparative Biology. This award will help cover the costs of her 2017 field season on Kolombangara Island in the New Georgia Province of the Solomon Archipelago. 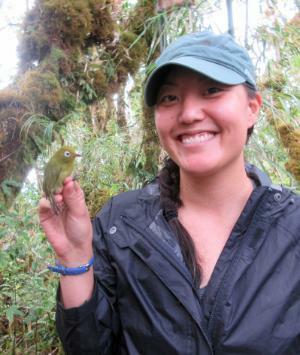 On the small 15-km wide island of Kolombangara, two species of White-eye birds in the rapidly-speciating Zosterops genus have come into secondary contact. As part of her dissertation, Sarah is using two replicate elevational transects to examine the levels of gene flow, morphological divergence, and species recognition in areas of overlap and non-overlap between the two species. Karla Rivera-Cáceres, a University of Miami biology graduate student, plays a harmonious duet of singing wrens from a recording she captured out in the field during a recent trip to Costa Rica. "The song sounds like one bird but if you listen closely, it’s a male and female wren singing a duet in perfect unison,” said Rivera-Cáceres. 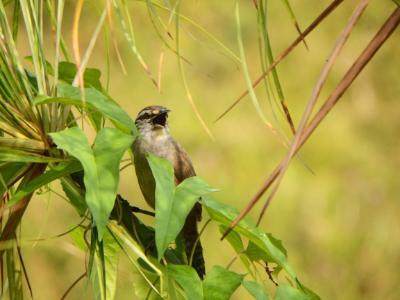 Along with songbirds, many animal species perform duets, an uncommon vocal interaction that can occur between mated or unmated species, such as frogs and crickets. But the coupled wrens Rivera-Cáceres recorded in Costa Rica sing alternating phrases, or parts, of the song so smoothly and with such complexity and fast tempo that the untrained ear may hear just a single bird. For years, Rivera-Cáceres studied the “duet codes” (non-random association of song types) of paired wrens and wondered if the ability to perform their complex and seamless music was a skill the birds were born with or learned during juvenile or adult stages of life. Now, after two months of intense listening in Costa Rica, she knows that they can learn new songs with new partners, even as adults. She says the newly learned songs are akin to prenuptial agreements. “It’s like the birds think: If you’re willing to invest the time and energy to learn a new duet code, then I am sure you are not going to leave me because if you do, you would lose a big investment and would need to learn a whole new duet code with another partner,” she said. ‌‌‌‌‌‌‌‌The complexity of the human brain, with its 80 billion neurons, presents a tremendous challenge to understanding how it works. Fortunately, the nervous system is organized into small functional units called neural circuits with just a few neurons that communicate with each other to control a simple outcome, such as one behavior. As yet there is no neural circuit in any organism for which we understand how the dynamic pattern of electrical activity drives chemical signals between the neurons to drive behavior. In a new research study published in eLife, the Collins lab characterized in depth perhaps the simplest neural circuit in the nematode worm Caenorhabditis elegans, the egg-laying behavior circuit. Using cutting-edge ontogenetic approaches to record the patterns of activity of each cell in the circuit, manipulating activity of the cells and their ability to signal to each other, the Collins lab hopes to understand how these cells together produce the worm’s egg-laying behavior. They found the C. elegans circuit has “command neurons” that release serotonin to increase excitability of the rest of the circuit. The circuit is then able to respond to rhythmic pulses of excitation from a “central pattern generator” to coordinate egg laying with other behaviors like locomotion. The circuit also contains cells activated only when an egg is laid, releasing a signal to turn off circuit activity. These features that turn on circuit activity, generate a pattern of activity when the circuit is on, and then turn off the circuit when it has completed its function, are general features of many neural circuits. 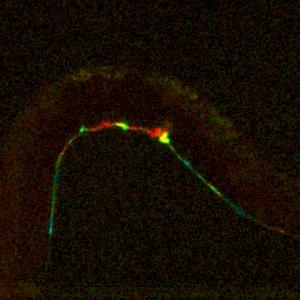 The C. elegans model system allows a powerful combination of genetic and optical manipulations of specific neurons so that details of all the signaling events among cells of a neural circuit can be delineated, promising that further studies will allow unprecedented mechanistic insights into how a neural circuit works. 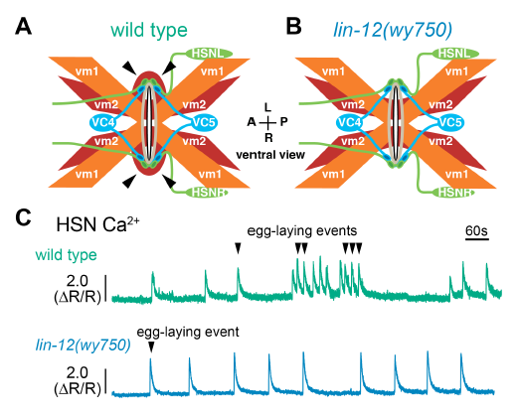 Figure Caption (left): A genetically encoded calcium reporter was used to record changes in cellular activity in the 6 VC motoneurons during egg-laying behavior. Red indicates high levels of intracellular calcium. Each adult worm is only 1 mm long, has exactly 959 somatic cells, and will produce >300 progeny during its ~2 week lifespan. A diving bird, the torrent duck is like a seal or penguin. Not in looks, of course, but in physiology. Like emperor penguins or Weddell seals, University of Miami researchers discovered, torrent ducks have among the highest concentrations of myoglobin, the protein that holds oxygen in muscle tissue. That’s partly how this tiny waterbird species, averaging less than a pound, expertly dives in high-altitude rivers in the Peruvian Andes and has managed to survive for close to a million years in permanent states of hypoxia, or lack of oxygen. Travelers can see the ducks in the surging whitewater on the train ride to Machu Picchu. This work was led by former postdocs Jaime Chaves & Liz Cooper and Aresty Professor Al Uy, in close collaboration with colleagues from UMass Amherst, McGill University and the Smithsonian Tropical Research Institute. ‌‌‌‌‌‌‌Understanding community dynamics and processes – such as what factors generate and maintain biodiversity and those that affect invasion susceptibility – is a central goal of ecology and evolution. While most studies of how species interactions affect communities have focused on highly visible macro-organisms, in a recent paper published in the journal Ecology, Assistant Professor Michelle Afkhami and a collaborator investigated the impact of a microbial “hidden player” on communities. They found for the first time that, despite minute size, micro-fungal endophytes dramatically increased the diversity of plant communities by suppressing a dominant invasive grass, Bromus diandrus, across ecologically diverse habitats. This research demonstrated that mutualistic microbes, while often hidden players, can have unexpectedly large ecological impacts and may be important for promoting diverse communities and ecosystems. 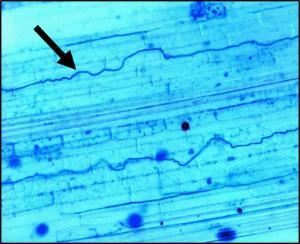 Image caption: Micro-fungal endophyte hyphae (dark blue lines indicated by black arrow) living between cells of its native plant host. Stained plant tissue under 200x magnification. ‌‌‌‌‌‌Mutualisms, species interactions in which all participants benefit, are extremely common in nature, so much so that organisms interact with many different mutualists throughout their lives. While essentially all species interact with multiple mutualists and these complex interactions play critical roles in providing ecosystem services and supporting biodiversity, in most cases our understanding of their biological consequences is lacking. ‌Building on a previous synthesis (Afkhami et al. 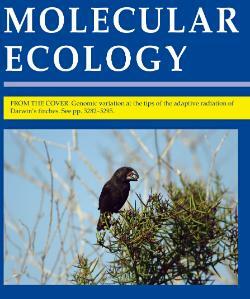 Ecology 2014), Assistant Professor Michelle Afkhami and a collaborator investigated the molecular basis of these complex multiple mutualist interactions in a recently published paper in the journal Molecular Ecology. Their work combined manipulative experiments and genomewide expression analysis to examine phenotypic and transcriptomic responses of a model legume Medicago truncatula to its interaction with nitrogen-fixing bacteria and mycorrhizal fungi. They found diverse molecular mechanisms and transcriptional responses associated with the synergistic benefits of multiple mutualists on plant growth, including genomewide signatures of mutualists and multiple mutualists on expression as well as surprising, nonadditive effects on some genes with important functions such as nutrient metabolism. For example, interacting with multiple mutualists even led to reversals in the direction of expression compared to interacting with single mutualists. Their results suggest possible biochemical mechanisms for how organisms balance these complex interactions and possible genetic targets for improvement of crop and forage plants. (A) M. truncatula plants at 2.5 weeks. 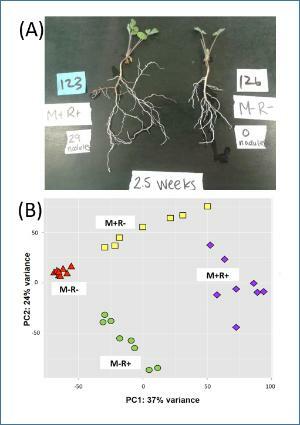 Left is a plant grown with both rhizobia and mycorrhizal fungi (M+R+) and right is a plant grown with neither (M-R-). (B) Principal components analysis of the M. truncatula genomewide expression profiles. The strong pattern of clustering by microbial treatment combination indicates that both mycorrhizal fungi (M+/-) and rhizobia (R+/-) have effects on expression across the genome. Each point indicates the transcriptome profile of an individual plant, and differences in the shapes/colors of points indicate different treatment combinations. 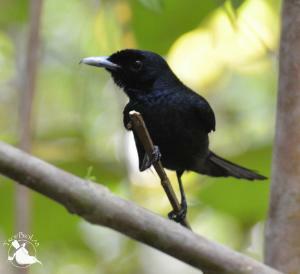 ‌‌‌‌‌‌ In a paper published in the Proceedings of Royal Society of London, Aresty Chair Al Uy with students, postdocs and collaborators show that different genetic mechanisms create the same plumage color in flycatchers from different islands in the Solomon Archipelago. In one island , a mutation in the Melanocortin-1 Receptor creates entirely black (melanic) birds, while over 100km away on a separate island, a mutation in the Agouti Signaling Protein creates the same melanic coloration (see picture to the right). In essence, evolution has found two different solutions to solve a single problem! These results are also featured in Islands of Creation, a documentary by the Smithsonian Channel. 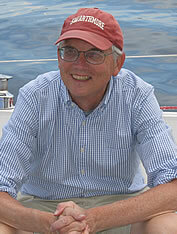 ‌‌‌ ‌‌Congratulations to Maytag Professor Bill Searcy for being elected as President of the Animal Behaviour Society. Established in 1964, the Animal Behaviour Society is a "professional organization dedicated to promote and encourage the biological study of animal behavior in the broadest sense, including studies at all levels of organization using both descriptive and experimental methods under natural and controlled conditions. Both research studies and the dissemination of knowledge about animal behavior through publications, educational programs, and activities shall be encouraged." ‌‌‌‌Luis Vargas-Castro was selected to receive the 2016 Dean’s Academic Year Dissertation Award from the College of Arts & Sciences and the 2016 Academic Excellence, Leadership and Service Award from the Graduate Student Association. 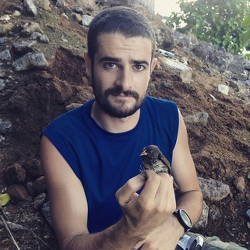 His dissertation focuses on the ecology and evolution of soft song, a complex behavior, in the avian genus Turdus. Soft vocalizations have been less studied than broadcast vocalizations because these are inconspicuous behaviors by nature and thus difficult to observe and record. However, soft singing is a widespread behavior among different animal taxa for which still little is known in animal communication. Luis’ work integrates behavioral, ecological and evolutionary processes, by analyzing the effects of ecological and morphological factors that shape animal signals. After doing fieldwork in Costa Rica and working with worldwide acoustic libraries, his research will provide experimental tests of important hypotheses that explain the properties of animal sounds and new insights on the evolution of complex behavioral traits. 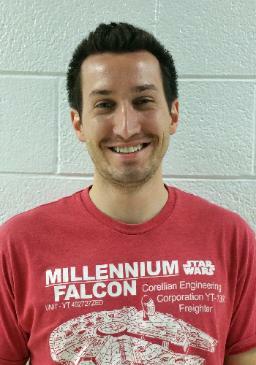 Luis is currently a graduate student in William Searcy’s lab. His research has been supported by the Kushlan Graduate Research Fund, Savage Graduate Research Fund and a Research Fellowship from the Organization for Tropical Studies. More about his research work can be found on his website. 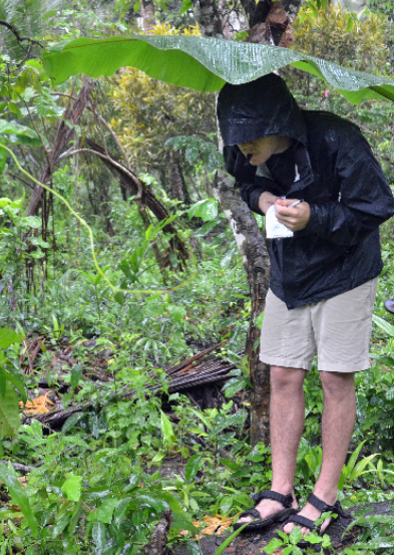 Luis recording birds songs in his field site in Costa Rica. 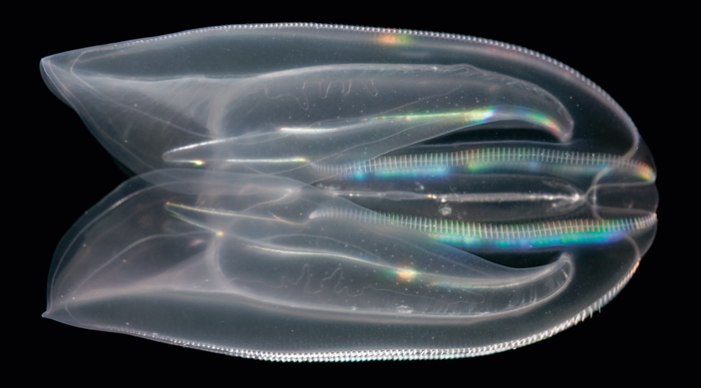 Ctenophores have historically been described as having a blind, sac-like gut. Using live imaging of ctenophore digestion in their report, Presnell et al. 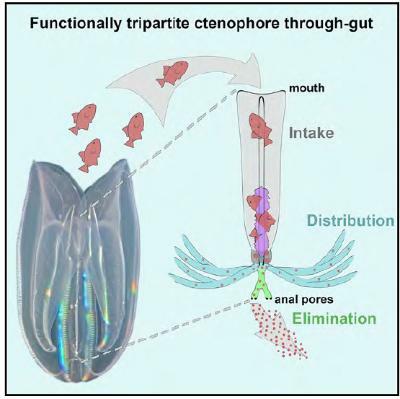 demonstrate that ctenophores possess a functionally tripartite through-gut, challenging the current paradigm that assumes that the through-gut originated within Bilateria. ‌‌ The Dallman Lab with first author Rob Kozol and contributions from Alex Abrams, David James, Qing Yan, and Elena Buglo publish a solicited review "Function over form: Modeling groups of inherited neurological disorders in zebrafish" in a special issue of the journal Frontiers in Molecular Neuroscience.